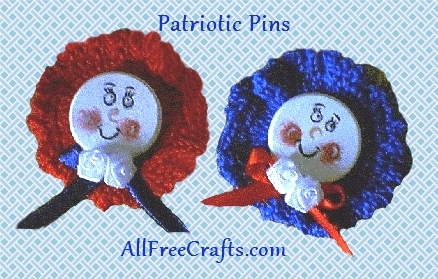 Show your support for your country with these round button pins with a crocheted edging. Rnd 3 Ch 1, sc in next dc, ch 3) rep around, join in beg sc, fasten off. Paint the wood disk white, let dry. Dry brush two little rose cheeks, let dry. With a thin permanent marker, draw the eyes, eyebrows and smile on. Put on a sealer, let dry. Glue the wood face to the center of your crochet circle. Glue on the thin ribbon bow and then glue on the ribbon roses. Last, glue on the pin back. Enjoy !